Well this is a little disappointing, although not without precedent. Both Sony’s PlayStation 4 (PS4) and Microsoft’s Xbox One (the Kinect-less version pictured above, obviously) scarf down a lot more electricity than their immediate predecessors (their respective “slim” versions), according to a report from The Natural Resources Defense Council (NRDC). In fact, they consume “two to three times more annual energy,” said the NRDC. The good news is that they consume less than the launch versions of the PlayStation 3 and Xbox 360. And if history is any guide, there’s reason to hope that future iterations will be more energy efficient. For now, gamers that have upgraded to the new consoles better be ready for heftier power bills. 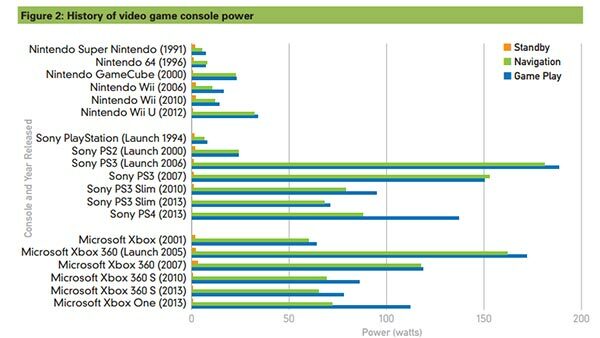 Putting it all together, the Xbox One consumes 233 KWh/y on average, the PS4 181 kWh/y, and the Wii U 37 kWh/y. The Xbox One’s annual energy consumption is therefore roughly 30 percent higher than the PS4’s, on average, and more than six times higher than the Wii U’s. In total, consoles are predicted to consume 10 – 11 billion kilowatt hours per year, enough to power Houston, the fourth-largest U.S. city.You can check out the rest of the NRDC’s finding’s here (PDF).